Happy Sunday to all. The weather is hot and so humid, but we have been getting some rain for the last 4 days and then back to the horrible heat! I have been working on 2 projects, Nesting and York Lodge blocks. The border for Nesting is not complicated so I am pretty sure I can finish it by the end of the month or before! Tomorrow is Radio Frequency treatment for my back – they cauterize the nerves from the waist down and it really helps! So while ‘resting’ I will work on Nesting as soon as the twilight wears off! Progress is being made on Nesting. 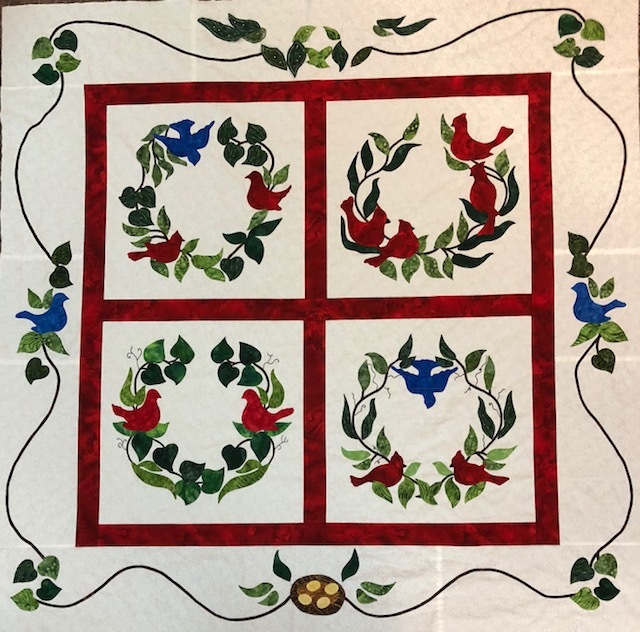 The top border has 2 Red Birds, and each border side there is a Blue bird. On the bottom border there is a nest with eggs! Each corner has the 4 leaves. There is some embroidery left to complete, but I usually do this when all the applique is complete. 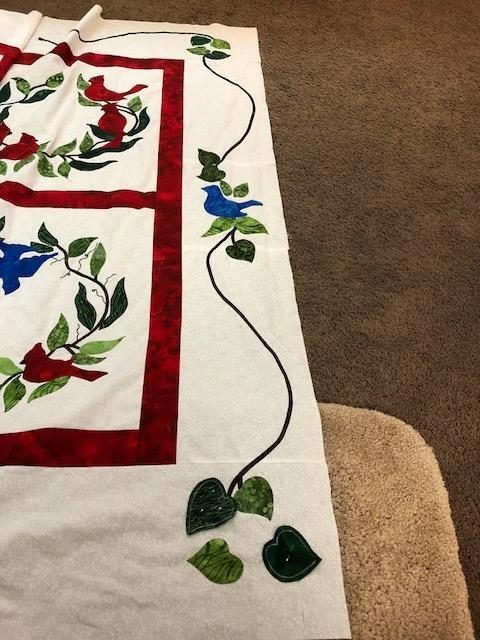 This is going to be a striking quilt and will be hand quilted! Hummm maybe this will be one that is going to be loaded on that new Grace Z44 frame that I purchased over a year ago. The other project I am working on is York Lodge. I have completed 10 of the 30 blocks that make up this quilt. I am excited because each time I make one it takes less and less time! Guess the saying ‘practice makes perfect’ still goes! I am thinking that Wednesday or Thursday I will begin to cut some HSTs and add them to each corner in order to square each block. The blocks will square to 10″ finished and 10 1/2″ unfinished so these are not large blocks I am making! A lot of work, but I do believe this will be a great Show Quilt next year. I have not seen anyone else making it. The pattern is neatly tucked away in a Quiltmania book! I am not sure, but that orange star with that dark background may be the first to square – just in case there is a problem. It will not hurt my feelings if I have to make another orange as this background really sticks out like a sore thumb. But that was my mood for the day! LOL I am very happy that all my points are turning out perfect, and crossing my fingers that all works out when I square the block or I will be one upset puppy! I am off to cut out 5 more blocks and then hopefully I will complete one more for today. the block on the bottom is the one I completed this morning. My goal is for 2 per day and hopefully 3 a day as I get closer to completion. Final goal would be end of July to have it completed. 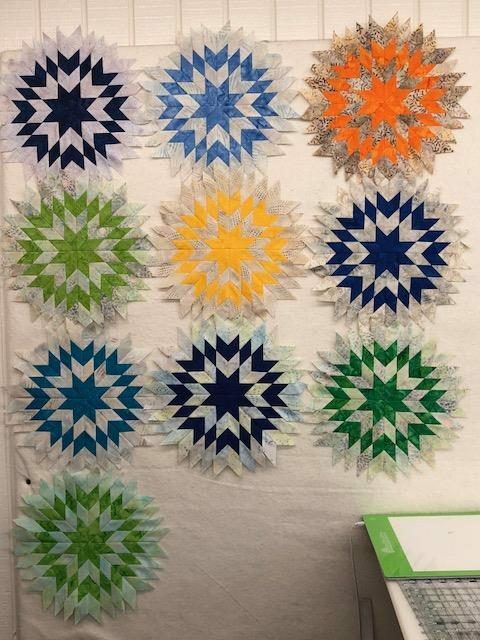 The quilt will be put together with a sashing and there will not be a need for a border as this would take away from the floating star effect. I am not sure which fabric I will use for the sashings, but thinking about the P&B white or a Batik white.